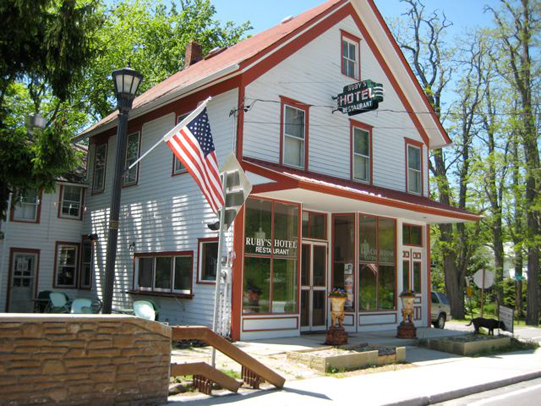 Ruby’s Hotel is a charming boutique hotel with 2 rooms and a fine art gallery located above the restaurant. 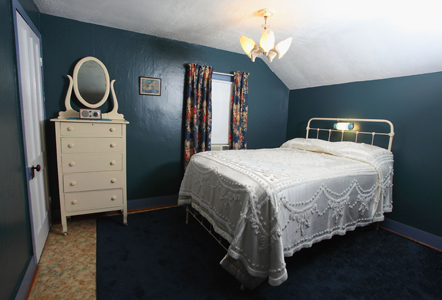 The rooms are completely restored to their 1930’s era glory. 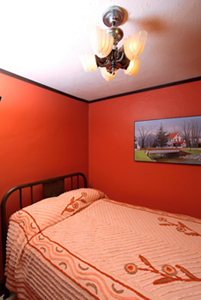 Original metal beds (with new posturepedic mattresses), extraordinary lighting fixtures, classic drapery, and every other authentic vintage detail make you feel like you have stepped back in time. There is no TV or WiFi, but we do have good radios, a deck of cards and a box of dominos. TV, WiFi, a pool table and electric games are available at the Freehold Pub just a hop, skip and a jump down the road. 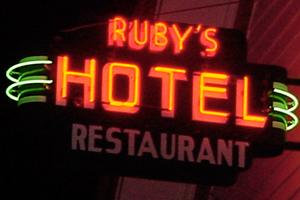 Ruby’s Hotel is set up like a European pension where you get a key to enter the building and a key for your room. A coffee maker and mini refrigerator are located in the hallway and shared by both rooms.